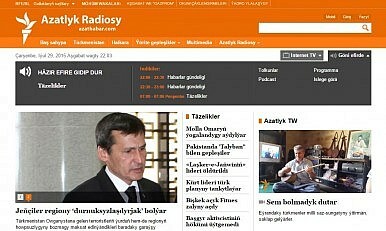 RFE/RL’s Turkmen service is under increased pressure. One correspondent quit in June and another was arrested in July. On July 28, reports from Alternative News Turkmenistan (ATN) confirmed the arrest of a freelance correspondent for RFE/RL’s Turkmen service, Azatlyk, in what is shaping up to be a sustained crackdown on the service’s activities. Saparmamed Nepeskuliev has been collaborating with both Azatlyk and ATN, providing them with video footage of developments taking place inside the secretive, totalitarian state. Nepeskuliev is said to have been arrested on July 7 in the Caspian resort of Turkmenbashi on his return home to Balkanabat. The journalist’s family reported him missing to the Balkanabat police department on July 8 after he failed to return home. On July 28, his family eventually found him alive and jailed in the village of Akdash. He was allegedly detained for carrying pills “containing narcotic substances,” and he is expected to be tried and sent to prison soon. This is not the first incident in the Turkmen regime’s increased harassment of RFE/RL workers in recent months. Osmankuly Hallyev, a Turkmen service correspondent since 2006, resigned from his job on June 8, citing an aggressive campaign of intimidation by the country’s anti-terror forces. With increasing border insecurity and economic woes in the country, it’s perhaps unsurprising that the regime has started paying more attention to Azatlyk’s reports. The evolution of Turkmenistan’s autocratic, post-Soviet regime has involved a substantial centralization of the national media. Since its first edition in 2002, the annual Press Freedom Index from the Paris-based NGO Reporters Sans Frontiers (RSF) has regularly ranked the regime as one of the most serious offenders. In addition, Freedom House’s 2015 Freedom of the Press Index ranked Turkmenistan 197th out of the 199 countries surveyed. According to article 28 of the 2008 constitutional draft – a revision of the 1992 constitution – “Citizens of Turkmenistan have the right to freedom of opinion and expression, as well as to receive information if it is not a state or other secret protected by law.” Both Saparmurat Niyazov, and his successor, Gurbanguly Berdimuhamedov, have failed to provide these basic human rights. The Niyazov regime was particularly appalling in its violation of press freedom, with instances of journalistic oppression and physical violence occurring on a regular basis. RFE/RL was, of course, a prominent target. In September 2003, Saparmurat Ovezberdiev, an Azatlyk correspondent, was held in custody for three days and reportedly tortured by the police. Controversially, Ogulsapar Muradova died three months later, with security officials having claimed her death to be a result “natural causes.” However, when her family was asked to identify her body at the morgue, they reported a “large wound” on her head. When they demanded to have an independent doctor examine the body, they were promptly threatened. The case has since been referred to as a “political assassination” by prominent NGOs, including the Turkmen Helsinki Foundation for Human Rights. Berdimuhamedov’s regime has largely continued this campaign of violence and intimidation. In June 2008, ahead of the EU-Turkmen meeting on human rights in Ashgabat, many journalists suffered harassment. Sazak Durdymuradov, a contributor for Azatlyk, was detained and ill-treated in prison. Furthermore, in the same month, a civic activist from Balkanabat, Gurbandurdy Durdykuliev, was targeted by the authorities. His 10-year-old son Aman was forcibly taken from a summer camp in a bid to intimidate him. In tandem with state harassment of local activists has been the use of barbaric practices within the country’s prison system to further break the will of any dissenting voices. A September 2014 report by the watchdog group, Crude Accountability, provided substantial evidence into the widespread use of torture and state terror inside Turkmenistan’s most notorious prison, Ovadan Depe, in the middle of the desert just outside Ashgabat. Among its macabre methods is the use of Turkmenistan’s harsh climate. Some prisoners are left outside in open cells during scorching temperatures as high as 50 degrees Celsius (122 degrees Fahrenheit), and in winter they suffer severe temperature drops in unheated cells. Regular beatings and the intentional overcrowding of cells, with up to 12 prisoners per cell, were also listed among the methods of psychological torture employed by Ovadan’s guards. Finally, cylindrical cells were also reported, specially designed to keep out light when placing prisoners in solitary confinement. Additional, small-sized cells were reported, referred to as “hunchback” cells due to their purpose of stopping prisoners from standing. Crude Accountability also has a “Prove they are Alive!” campaign highlighting the numbers of prisoners who have gone “missing” from Turkmenistan’s prison system. In particular, the campaign is focused on the whereabouts of the so-called “Novembrists,” who were accused of plotting the attempt on Niyazov’s life in 2002. Along with retaining the abusive prison system, and harassment of journalists, Berdimuhamedov has also been working to remove satellite dishes in Ashgabat. At the end of March, 2015, local housing authorities in Ashgabat, and its suburbs started ordering residents of multi-story apartment buildings to take down their satellite dishes, citing simply an “order from above.” The measure will further sanitize Turkmenistan’s domestic information space. Satellite television’s penetration in the capital is significant, with Chinese-made dishes costing as little as $50 flooding the market. Reportedly, each family in Ashgabat has at least one satellite dish. Access to these is crucial, since it offers a small window for loosening the regime’s grip on information. The dishes also provide access to Azatlyk’s reports. Azatlyk has been operating in Turkmenistan unofficially since 1953, and is the only independent source of information about Turkmenistan and the world in the Turkmen language, making it a vital source of information in the country. Currently, the organization attracts 143,000 monthly visits to its web and mobile sites, with over 98,000 followers on Facebook. With uncertainty growing inside the country, Azatlyk’s reports are more important than ever before. And that’s exactly what the ruling elites are afraid of. Bradley Jardine is a Central Asia researcher and writer currently interning with RFE/RL. No visit is planned as of yet, but Atambayev knows what he’d like to discuss.